Concerned filmmakers, classic film fans and architectural preservationists are working to save an iconic Hollywood landmark from the wrecking ball. Former RKO Radio Pictures facade on Stage 21 of the Paramount Pictures lot in Hollywood (Credit: Tim Hull/Save RKO Globe). According to the Los Angeles Visionaries Association, Paramount Pictures proposed a master plan to remodel their large studio complex in Hollywood. When the plan was revealed in Oct. 2015, the studio is planning to tear down eight stages, along with several other buildings on the lot. One of the buildings that are planned for demolition is stage 21. On the exterior of that building, it features the old RKO globe facade. The building (with the globe) faces the corner of Gower Street and Melrose Avenue. The globe on the building originally contained a radio tower sculpture with “RKO” in neon lettering, in the spirit of the opening logo for RKO Radio Pictures, which featured a model radio tower atop the globe beaming out a Morse code signal with the phrase, “An RKO Radio Picture” (or in the studio’s earliest releases, “A Radio Picture”). Several years before RKO Radio Pictures (or Radio-Keith-Orpheum) was formed in 1928, the lot was originally part of Joseph P. Kennedy’s Film Booking Offices of America, which was located next to rival studio Paramount. 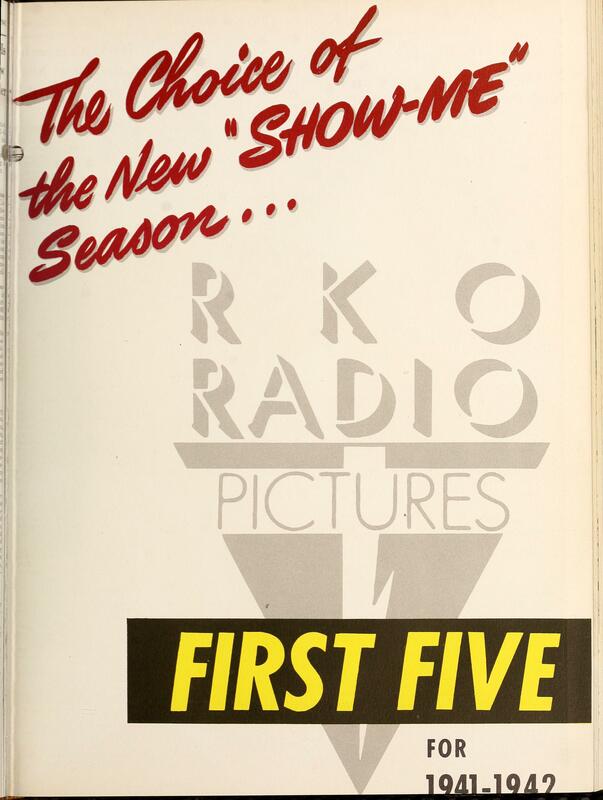 According to the 1987 BBC documentary “The RKO Story,” Kennedy’s film organization would merge with the Keith-Albee-Orpheum theater chain, along with David Sarnoff’s Radio Corporation of America (RCA), which held in interest in the newly-formed company (to showcase the growing technological firm’s entry into sound motion pictures). 1948: Industrialist Howard Hughes would acquire RKO (and the studio properties). From that point on, Hughes’ ownership would plague the company. 1955: Hughes sold RKO to General Tire’s broadcasting subsidiary, General Teleradio (which would be renamed RKO General). General Tire was interested in purchasing RKO for its backlog of vintage films to show on the company’s TV stations. 1957: Desi Arnaz and Lucille Ball purchased the RKO lot (and additional RKO studio facilities) from General Tire. The couple’s production company, Desilu wanted to expand the company’s production facilities (the former RKO lot would complement Desilu’s other production facility on Cahuenga Boulevard, now home to RED DIGITAL Studios). Before hitting it big with “I Love Lucy” and Desilu Productions in 1951, both Arnaz and Ball were RKO contract players in the 1940s (where the two met together). Paramount acquired the adjacent lot from Lucille Ball in 1967, as part of Gulf+Western Industries’ purchase of Desilu Productions (G+W absorbed the ailing Paramount studios one year earlier, so that the conglomerate’s motion picture subsidiary could enter network television production in addition to expanded feature film productions on the combined lot). The studio would exit network television production and syndication in early 2006, as part of Paramount’s parent (Viacom) being split into two companies. The former Paramount/Viacom broadcast television holdings reside with CBS. While the studio still owns the old RKO/Desilu side of the lot, the company recently went back into television production. Recently, a petition was created on Change.org, titled “Save the RKO Globe.” Launched by independent filmmaker Tim Hull, over 2,064 people have signed the petition to let Paramount studios know that they should not destroy Hollywood history. According to updates on the companion Facebook site, Hull has contacted officials from The Hollywood Bowl to relocate/restore the old RKO globe (if Paramount dismantles it from stage 21). If you’re a fan of vintage/cult film and television (whether it was produced by RKO, Desilu, Paramount or other production companies)- the author of this site highly encourages everyone to sign the petition to save the RKO globe from destruction. After being in the motion picture business for 104 years, one would think that Paramount and its affiliated companies would know better by preserving Hollywood film and television history. The iconic RKO globe on the Paramount lot should not be lost- it should be preserved for all generations. One of the area’s most popular cinematic events for the summer will not take place in the nation’s capital this year. “Screen on the Green” was a yearly summer film festival where classic, contemporary and cult motion pictures (along with short subjects) are showcased on the lawn of the National Mall in Washington, D.C. According to WTOP Radio reporter Colleen Kelleher’s report in May on the future of the cinematic event, the festival was cancelled this year due to two corporate backers dropping out of the event. The two sponsors were Time Warner-owned premium cable network Home Box Office (HBO) and cable/media conglomerate Comcast. HBO has sponsored the event for 17 years. 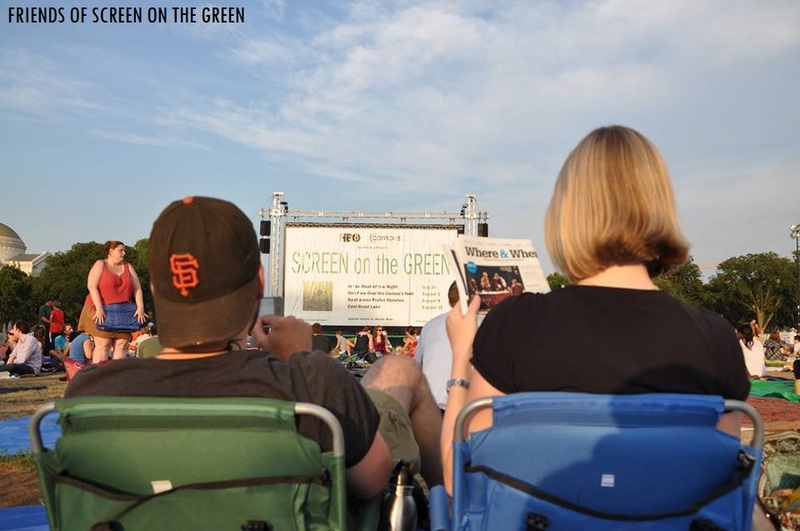 After the cancellation of the series, the “Friends of Screen on the Green” organization is looking for other companies, individuals and organizations to sponsor future “Screen on the Green” screenings, according to the group’s Facebook page. The group has also reached out to the Trust for the National Mall for alternate backers or other possible opportunities to keep the event alive for current and future generations. The organization is looking for ideas from spectators who have attended past screenings and interested persons in keeping the event alive for future summer film screenings on the grounds of the National Mall. Editorial Note: Despite the cancellation of this year’s event, let’s hope that future “Screen on the Green” events will occur in Washington. These types of outdoor film screening events are a great way to escape from the ordinary. Downtown Frederick Partnership’s “Movie Night on the Creek” Summer Outdoor Film Series Similar to “Screen on the Green,” Downtown Frederick Partnership’s series specializes in modern film favorites. Questions/Comments/Feedback? Drop a line at the comments section! PROLOGUE: This editorial piece is not endorsed or approved by any studio or cinema circuit/firm. The City Opera House. The Tivoli. Holiday Cinemas. Hoyts Frederick Towne Mall Twinplex/10-screen cineplex. Cinema Center 3. FSK Cinemas III. Westridge Cinemas 6. Westview 16. Throughout the years, many cinema venues have come and gone in Frederick. Today, the area’s cinema choices consist of Regal’s first-run 16-plex Westview Promenade complex, the second-run Holiday Cinemas and for classic/retro screen entertainment, The Weinberg Center For The Arts (the former Tivoli cinema, whenever live stage performances are not taking place). 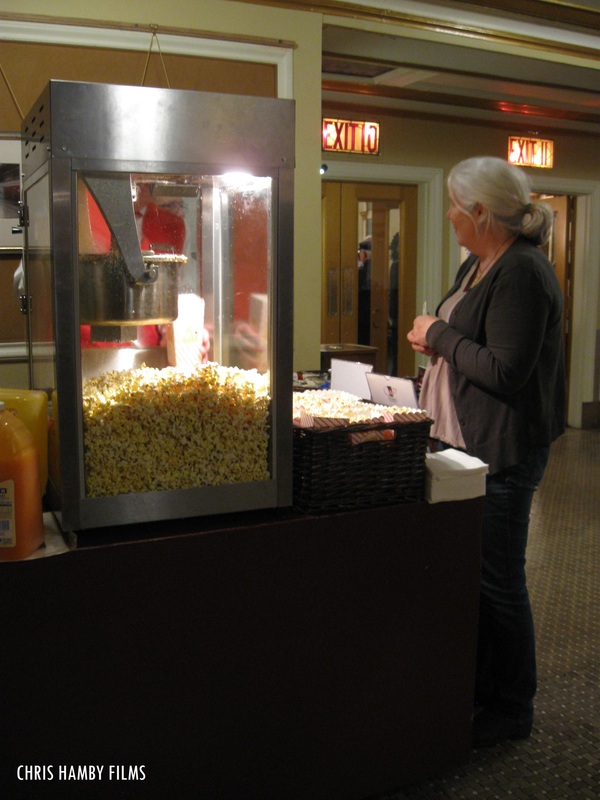 With the industry’s transition from releasing physical film prints to distributing content through digital cinema platforms (via hard drive or satellite-fed content), it has opened the window to classic, cult and special movie events being shown in select theaters from coast-to-coast in addition to current releases. “Silver Screen Reflections” asks: Is it time for another first-run cinema venue in Frederick? Due to the area having only one first-run cinema location, the Frederick area has missed out on many opportunities to showcase special Fathom Events screenings of cult/classic films and special events. Other estimated factors may include licensing costs, lack of equipment (and auditorium/venue space) to showcase content, or lack of interest. These include (but are not limited to) Turner Classic Movies’ “Big Screen Classics” classic/cult film showcase, “RiffTrax Live” theatrical film riffing events (featuring MST3K alums Mike Nelson, Bill Corbett and Kevin Murphy), independent features, along with live broadcasts of rock concerts, performances direct from the Metropolitan Opera and other popular big-name venues throughout the world. Something for everyone: Classic, cult and independent films, along with other special cinema events (including live events being broadcast) would be a perfect complement in addition to recent releases. Discount ticket prices for college students and senior citizens (in addition to “bargain matinee” showdates): Perfect for every taste in cinematic entertainment. 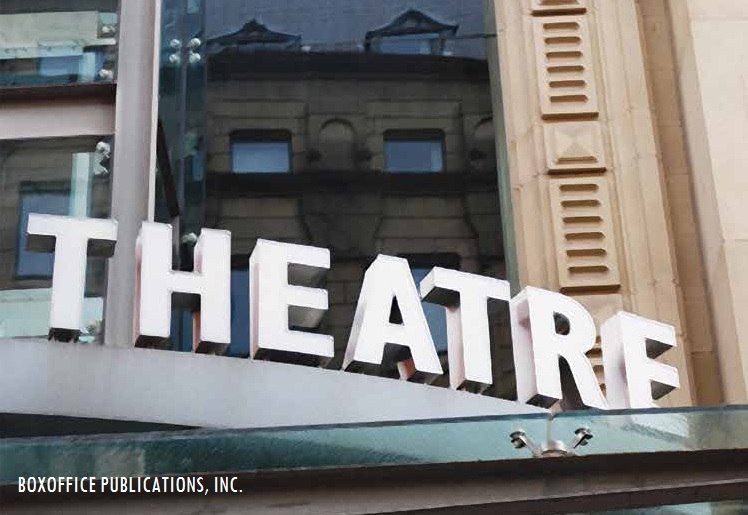 A theater that’s visually appealing in theatrical picture and sound presentation: A venue that would rival the traditional “cookie-cutter” cineplex exhibition rooms of today. An “Alamo Drafthouse-style” Policy Trailer: Take Leonard Maltin’s advice before watching the movie on the big screen. People may not want to drive far to see their favorite films on the big screen (if the film is unavailable for showing in the area):**– Though this may sound awkward to some, many are still saving money due to the lackluster economy. **Unless if it is a good cinema/theatrical venue. The Management of “Silver Screen Reflections” would like to hear from you! Whether you are for or against the idea of another first-run cineplex venue in the Frederick area, “Silver Screen Reflections” gladly welcomes comments and additional suggestions on this. The thought of another first-run cinema venue means that it doesn’t have to be the size of the ArcLight cineplex in Bethesda, Cinemark’s Egyptian 24 multiplex at Arundel Mills or an Alamo Drafthouse venue- just something that would give Regal’s Westview cineplex some competition. Around the Fourth of July, many fans of classic cinema will be looking forward to watching one of the definitive perennial greats in screen entertainment. 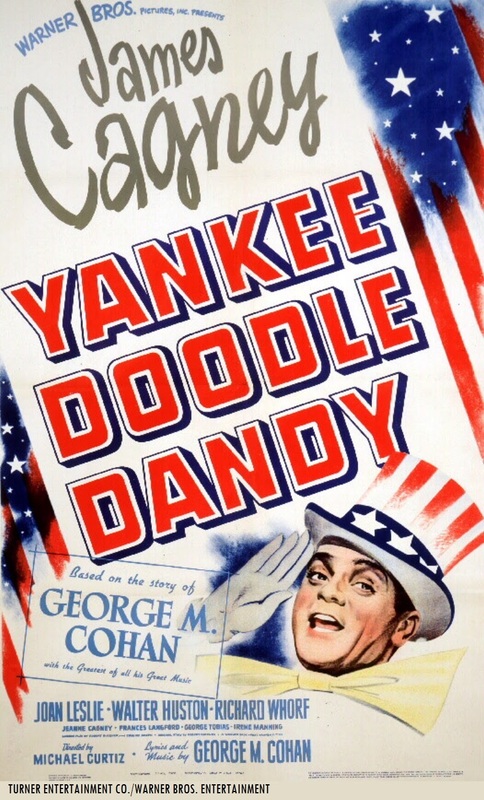 Poster for Warners‘ “Yankee Doodle Dandy” (1942), featuring James Cagney as George M. Cohan. That definitive classic is 1942’s “Yankee Doodle Dandy.” Directed by Michael Curtiz and produced by Hal B. Wallis, the film features James Cagney (as George M. Cohan), Joan Leslie (as Mary Cohan), Walter Huston (as Jerry Cohan), Richard Whorf (as Sam Harris), Irene Manning (as Fay Tempelton), George Tobias (as Dietz), Rosemary DeCamp (as Nellie Cohan), Jeanne Cagney (as Josie Cohan), Frances Langford (as Nora Bayes), S.Z. “Cuddles” Sakall (as Schwab), and Eddie Foy, Jr. (as the senior Eddie Foy). Based off the story of real-life songwriter George M. Cohan (1878-1942), the film goes into the life, times and career of the multi-talented entertainer and songwriter, who brought such popular classic songs including “Yankee Doodle Dandy,” “Over There,” “You’re A Grand Old Flag,” just to name a few. When the film premiered in New York at the Hollywood Theatre in May 1942, it was tremendous hit, and was one of the top-grossing motion pictures of that year. According to The New York Times, the audience on opening night purchased $5,750,000 worth of war bonds to help America’s war effort during the Second World War. The film won three Academy Awards for Best Actor (James Cagney), Best Sound Recording (Nathan Levinson and the Warner Bros. sound department), and Best Music, Scoring of a Motion Picture (Ray Heindorf and and Heinz Romfeld). Warners has released Yankee Doodle Dandy on Blu-Ray (through the studio’s “Archive” line), from a new high-definition transfer (along with several extras ported over from the DVD release). It is also available for streaming on Amazon, iTunes and Warners’ YouTube VOD service. 1958 advertisement for Associated Artists Productions (A.A.P. 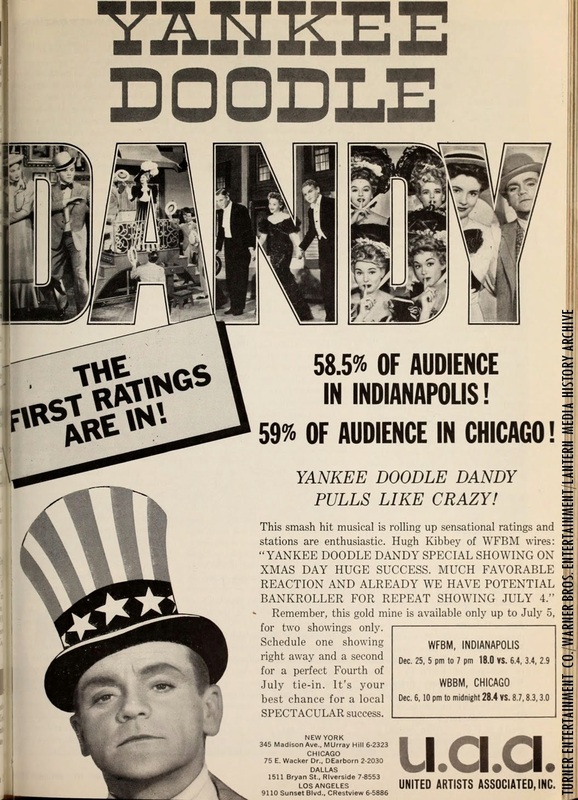 ), advertising the 1942 film Yankee Doodle Dandy, one of many pre-48 Warner Bros. feature films (along with shorts and select cartoons) that were available for syndication to local television stations. To all fellow readers- if you haven’t seen “Yankee Doodle Dandy,” see it when you have the chance to. It is an entertaining and enlightening motion picture about the life and times of George Cohan, portrayed by James Cagney (in one of his few non-gangster roles on the screen). 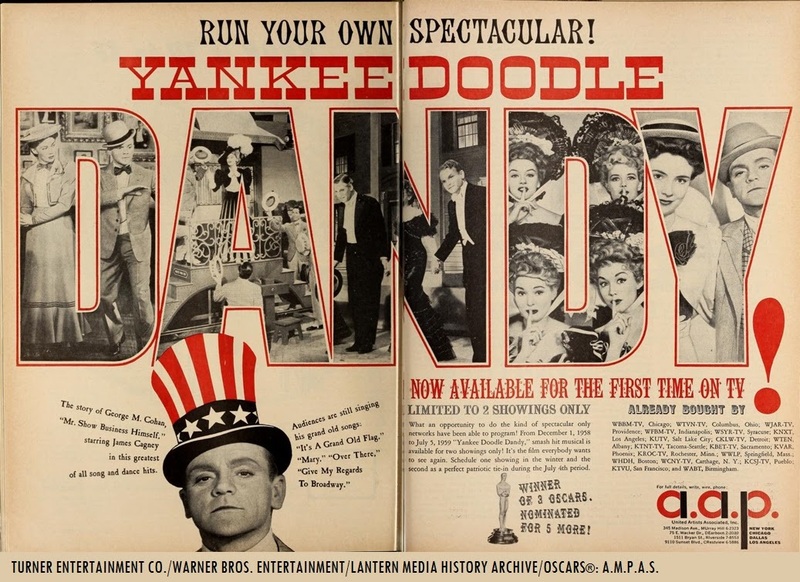 “Yankee Doodle Dandy” is one of the best examples of uplifting screen entertainment. You won’t be disappointed! 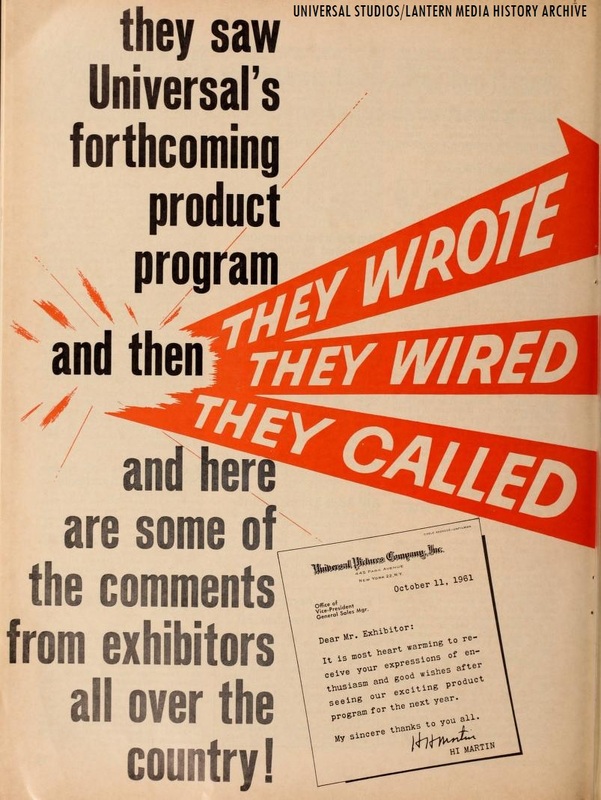 1959 Trade ad for United Artists (which bought A.A.P. in late 1958) and their package of pre-1948 Warner Bros. features (for TV), showcasing the 1942 James Cagney musical Yankee Doodle Dandy. NOTE: This was when UA had the rights to the pre-1948 WB features. Turner Classic Movies will be showing “Yankee Doodle Dandy” (1942) on the Fourth: As part of a collection of entertaining films related to America’s day of independence, the 1942 classic will be shown at 10:45 p.m., right after the 1962 Meredith Wilson musical “The Music Man” (featuring Robert Preston, Shirley Jones and Ron Howard), which will be shown at 8 p.m.
Other films that will be shown will include the 1972 film adaptation of the musical “1776” (featuring William Daniels, Howard Da Silva and Ken Howard) at 1 a.m., followed by “Thousands Cheer” (1943, featuring Kathryn Grayson, Gene Kelly and Mary Ator) at 4 a.m.
Before the primetime offerings, the network will show various classics related to Americana, including “Judge Hardy and Son” (1939, featuring Mickey Rooney, Lewis Stone and Ann Rutherford) at 6 a.m., “The Howards of Virginia” (1940, with Cary Grant & Sir Cedric Hardwicke) at 7:30 a.m., “John Paul Jones” (1959, with Robert Stack) at 9:30 a.m., “The Scarlet Coat” (1955, with Cornel Wilde, Anne Francis, and George Sanders) at 11:45 a.m., “The Devil’s Disciple” (1959, with Burt Lancaster, Kirk Douglas and Lawrence Oliver) at 1:30 p.m., Frank Capra’s “Mr. Smith Goes to Washington” (1939, with James Stewart, Jean Arthur, Edward Arnold and Claude Rains) at 3 p.m. and Robert Wise’s film adaptation of the musical “West Side Story” (1961, with Natalie Wood, Richard Beymer, Rita Moreno and George Chakiris) at 5:15 P.M. The author of “Silver Screen Reflections” wishes all readers a happy, safe and exciting fourth- do something interesting and fun! Olivia DeHavilland (opposite her sister, Joan Fontaine), as featured in the September 1941 issue of Photoplay Magazine (Lantern Media Archive/Internet Archive). “Silver Screen Reflections” honors Olivia DeHavilland on her 100th birthday today. Best known for her prolific film roles in “Captain Blood” (1935, with Errol Flynn), “The Adventures of Robin Hood” (1938, w/Flynn) and David O. Selznick’s mammoth film version of “Gone With The Wind” (1939, with Clark Gable and Vivien Leigh), she challenged the studio system by winning a successful lawsuit in 1944 against Warner Bros. (over the seven-year studio contract). Turner Classic Movies’ “Star of the Month:” For the month of July, TCM will honor Olivia DeHavilland as their “Star of the Month” for July. This evening, the network will present several of DeHavilland’s memorable films, beginning at 8 p.m/ with “Raffles“(1939, with David Niven). “Gone With The Wind” (1939) will be shown at 9:15 p.m., followed by “The Adventures of Robin Hood” (1938) at 1:15 a.m., “The Private Lives of Elizabeth and Essex” (1939, with Bette Davis and Errol Flynn) at 3:15 a.m. and will conclude with “Captain Blood” (1935) at 5:15 a.m.
“Silver Screen Reflections” salutes Olivia DeHavilland on her 100th birthday.